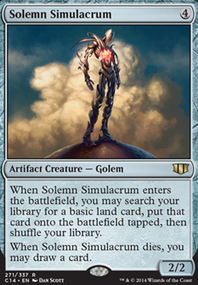 Are guildgates the only cards that work for the maze's end wincon? DrukenReaps That's true. I agree that it's at least 5 snakes, if not more if Ammit Eternal survives by my turn, making it possibly a few more, compared to the guaranteed 3 from Shambling Swarm . I would say that at least Shambling allows for removal for a X/1, X/2, X/3 on the board, AND, making 3 snakes. But I will admit that it's a top pick for cutting. Especially when I found out Desolation exists, heh. Possibly Gate to Phyrexia if I come across a lot of artifacts. CyborgAeon This isn't my competitive Shirei build, this is the one I actually own in Paper. I'm not going to drop hundreds more dollars on a Tabby and a Chains and a Mox Diamond and so on. Canal Dredger isn't the kind of recursion we actually want. Just because he technically works with Shirei doesn't automatically make him good--tutoring for things he gets back is cute, but I cut Elixir of Immortality and Feldon's Cane for the very same reasons. 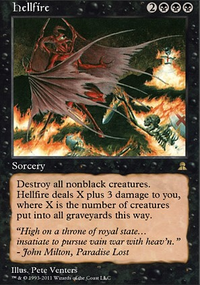 Yes, I have considered Coretapper , but this deck actually no longer has any combo wincons--the biggest 'combo' in this deck is making a billion mana with Coffers and Market and casting Exsanguinate or Torment of Hailfire . I've actually previously run Blood Pet , but, trust me, he's a little underwhelming. 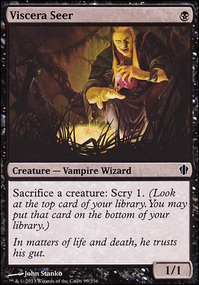 One extra mana often isn't crazy, and he doesn't actually help me ramp into Shirei if I want to keep using him--that's why I'm only playing so much ramp, my curve actually tops out at Shirei. I will consider Mox Amber and Toxic Deluge , but I need things that help me ramp into Shirei, and I already have a fairly diverse removal suite (albeit one that isn't quite as cheap as deluge). I could maybe cut Gate to Phyrexia or Pawn of Ulamog for them, but in this more casual version ($1000 decks are totally casual), I like having an artifact removal option, and Pawn is further mana insanity. 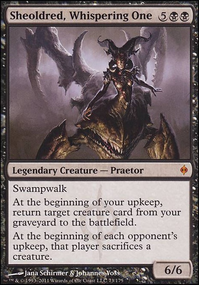 CyborgAeon It was an extremely difficult decision, but I cut Gate to Phyrexia for Praetor's Grasp and Smokestack for Leyline of the Void . Gate was my one way of specifically removing artifacts, but it doesn't immediately do anything, requires me to have something to sacrifice, and not a few artifacts are indestructible anyhow, so if we need to get rid of some artifacts, Oblivion Stone it is, I guess. Smokestack does more on its own than Leyline, but it also doesn't immediately do anything, and if my opponents can't remove a 4-mana artifact a turn after it's been put into play, I'd be very surprised. It's effectively just win-more--removing it does make my Inventors' Fair slightly worse, but that probably isn't an issue, anyhow. As for testing, I suppose I'll have to do that, yeah. Last_Laugh on Lie, Steal, Cheat, and SURVIVE! I have another color wheel breaker for you to consider, Gate to Phyrexia. Also, did you ever try Aura Thief? 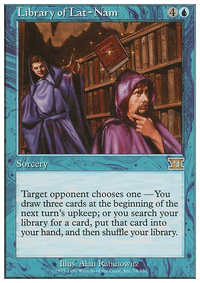 It's really good if you have a lot of stuff like Sylvan Library, Ghostly Prison, Aura Shards etc. in your meta. Rupp Yeah, I need some enchantment removal for sure... Only thing I can think of are colorless cards, though. 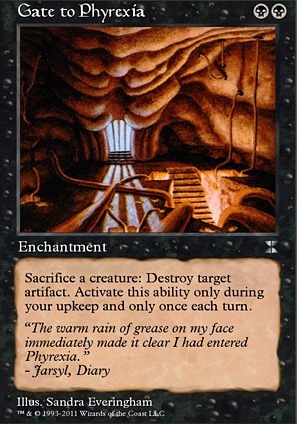 And Gate to Phyrexia, which I side board. Any other ideas? I know - pretty ballsy to play such niche tech vs those hyper competitive decks like tazri, breakfast hulk, hulkweaver, doompile, doomtide and Gitrog. But in all seriousness, I love your list. I don't know how much you like bob - great clamp fodder, even better card draw engine but with your list running so many fatties? You already abstain from Ad Nauseam because you need a health pool to raza-win. If I do testing this will be a tough choice for me (maybe to cut for Erebos, God of the Dead as 1: flavour, 2: hatebear vs aetherflux, 3: hurts some niche lines and 4: stymies recovery from a failed naus). Further cool stax packages: Gate to Phyrexia. I play in a heavy isochron reversal meta and rocks matter environment. For your sac theme this is potentially better than null rod. Lastly, have you thought about Beacon of Unrest? It's a very tough thing to squeeze in - but instead of having to assemble an entirely new combo after a table wises up to removing the altar.